In a state that prides itself on “feeding the world,” we currently struggle to adequately feed and nourish ourselves, reports Cole Cottin, lead analyst and author of the newly released report titled Feeding Kansas. After over a year spent in dialogue with hundreds of individuals across Kansas, this report from the Kansas Rural Center identifies seven pressing priorities Kansans can pursue right now to help strengthen the capacity of Kansas farms and farmers to more adequately nourish themselves and their communities. In this session, Cottin highlights key findings and recommendations from Feeding Kansas, and shares a vision and a roadmap for transforming Kansas’s agricultural and food landscape into a model of well-being and success to sustain future generations. Come join in this exciting conversation, and learn how you can take part! It is the belief of the Kansas Aqueduct Coalition that a properly developed Kansas Aqueduct Project process is a necessary element in securing economic stability and prosperity for the entire state of Kansas. According to the group, an action to reserve a 4 million acre feet amount early in that process rather than a person or Coalition filing an appropriation is an appropriate and necessary legislative action for Kansas. The revenues generated from agriculture in the western half of the state, and specifically in the areas served by the Ogallala Aquifer, are significant. A significant decline or decimation of those revenues would likely result in economic devastation for the entire state and, on a lesser level, the surrounding states. Kansas is respected as historically being progressive and forward-thinking in its use of water resources and this situation should be no different. The coalition feels the state of Kansas must act now to prepare for the future so as to avoid a water crisis that is almost certainly on the horizon. Nuts and bolts to starting a local food co-op and successes and challenges of growing its distribution, marketing, production and leadership capacity. National Farmers Union’s Chandler Goule will provide updates on DC politics. GIPSA’s programs directly and significantly impact two key sectors of American agriculture – the livestock and grain markets. Administrator Mitchell will provide insights into these sectors of the ag economy. Family farm advocate panelists: Ed Reznicek, Mary Fund, Linda Hessman, and Rachel Myslivy Kansas Family Farm & Food Advocacy Day will feature a local foods legislative breakfast, family farm advocates rally, and visits with members of the Kansas Legislature during the 2015 Kansas Legislative Session in Topeka. Learn the importance of being an advocate for family farming, strategies that work, and how to build personal relationships between members and legislators, while promoting a proactive discussion of the issues. Ballots available in the pre-convene area beginning at 2:30 p.m. Voting ends at 2:45 p.m. The Rockin H Ranch has transitioned from a typical cow/calf ranch to a diversified, mutli-species, Holistic managed, direct marketed, farm model of producing many different food products from T-bones to Lamb Chops, to goat milk ice cream, to Shitake Mushrooms and more. The farm now direct markets most of its production and and has developed new skills in marketing, sales, packaging, distribution as well as an entire gamut of improved socially responsible and regenerative farming practices that reflect the interest of an informed consumer. The model can be duplicated on different scales and sizes of operation utilizing techniques such as interns, apprentices, and the Farm Families that live and work on the 1100 acre southern Missouri ranch. The transfer of ownership, management and leadership from one generation to another is an important issue for farms, ranches and rural communities across Kansas. This winter, K-State Research & Extension and Kansas Agricultural Mediation Services will offer one-day succession conferences designed to educate and support families as they prepare for the future of the enterprise. 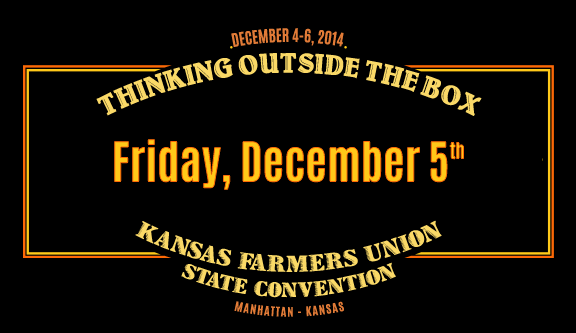 2014 Kansas Farmers Union Convention officially closes. We hope you will stay on for dinner and the evening event, Jim Richardson. National Geographic photographer and Kansas native Jim Richardson will serve up a vast visual journey: the Neolithic dawn of agriculture, today’s world farmers working in relative anonymity, the challenges of feeding an ever-more hungry planet through 2050. Richardson has photographed agriculture at home in Kansas and abroad for 20 years. He offers both a bird’s eye view of world agriculture — and a face-to-face experience of the people who labor every day to feed us. With more than 40 percent of the world’s surface already in agricultural production, how do we feed 9 billion? If you placed a bid on an auction item, please check the bid sheet to see if you won. KFU staff will be available to accept your payment at this time. Davidson’s presentation leads audiences through the history of the great state of Kansas, from the time of Coronado to the end of the 1800’s. Audience members will traipse the plains with early explorers, drive spikes on the first railways, plow in new ground, ride for the Pony Express, and eat the dust of the Chisholm Trail. Sit back and take a deep seat – the “winnin’ of the west” was not for the faint of heart. Exceptional speakers and expansive ideas as to what agriculture can be!